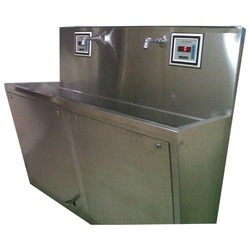 Our domain expertise has enabled us to come up with an excellent range of Scrub Sink. These products are manufactured under the supervision of our expert professionals using superior quality stainless steel at our capacious infrastructure. We offer the best quality products to our valuable customers, owing to which our entire range is highly praised by them. The offered range of scrub sink is appreciated for its corrosion-resistance, high strength, perfect finish and reliable performance. We are a reputed manufacturer, supplier and exporter of a vast array of Scrub Sinks. The range we offer is manufactured using excellent quality SS304 stainless steel with satin polish finish. These products have foot operated panel using operated taps. In our range; Single, double and triple bays are offered to customers.